Between Götterdämmerung and Les Troyens on the current Semperoper schedule comes this brilliantly staged Mozart singspiel, a revival of the Michiel Dijkema production that premiered last April. The action takes place outside the palace of the Bassa Selim with its gardens and ponds, and the silhouette of a city out of One Thousand and One Nights in the background. The costumes are colourful and fun in all cases and are the work of Claudia Damm and Jula Reindell. Finally, there is a good lighting by Fabio Antoci. Michiel Dijkema brings us a story suitable for children and boasts imagination and fantasy, especially in the parades for Selim, with its camels and crocodiles, which pleases the audience. The ‘abduction’ by Belmonte and Pedrillo and their ensuing capture are especially well done. It is a staging that can be enjoyed by both adults and children. Christopher Moulds’ conducting was competent but somewhat flat, though the Dresden Staatskapelle gave a good performance. Konstanze was played by soprano Gloria Rehm, whose voice is not really suited to the role. It’s not that Konstanze demands a dramatic soprano, but it does requires a lyric soprano with excellent agility since she has some difficult and rather dramatic arias to sing, such as ‘Martern aller Arten’. Gloria Rehm is a light soprano, a soubrette who can do the part of Blonde well (she recently sang it in Frankfurt), but not Konstanze. There was practically no contrast between the voices of Konstanze and Blonde. Tenor Norman Reinhardt as Belmonte did a satisfactory job. His voice is appealing but sounded rather small here. 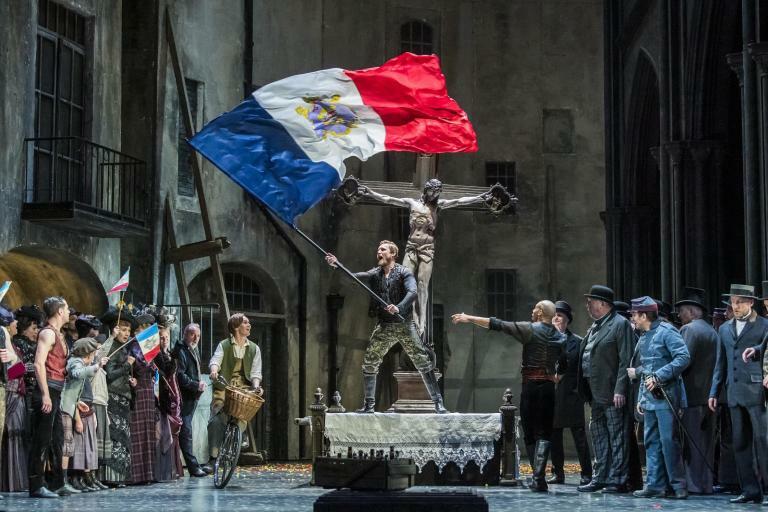 Michael Eder was to have sung the part of Osmín, but he cancelled at the last minute and was replaced by Michail Schelomianski, who saved the show with a strong performance. Sibylla Duffe in the part of Blonde was the best in the cast. She sang with joy and taste and was completely comfortable on stage. .Finally, Aaron Pegram was a convincing Pedrillo.